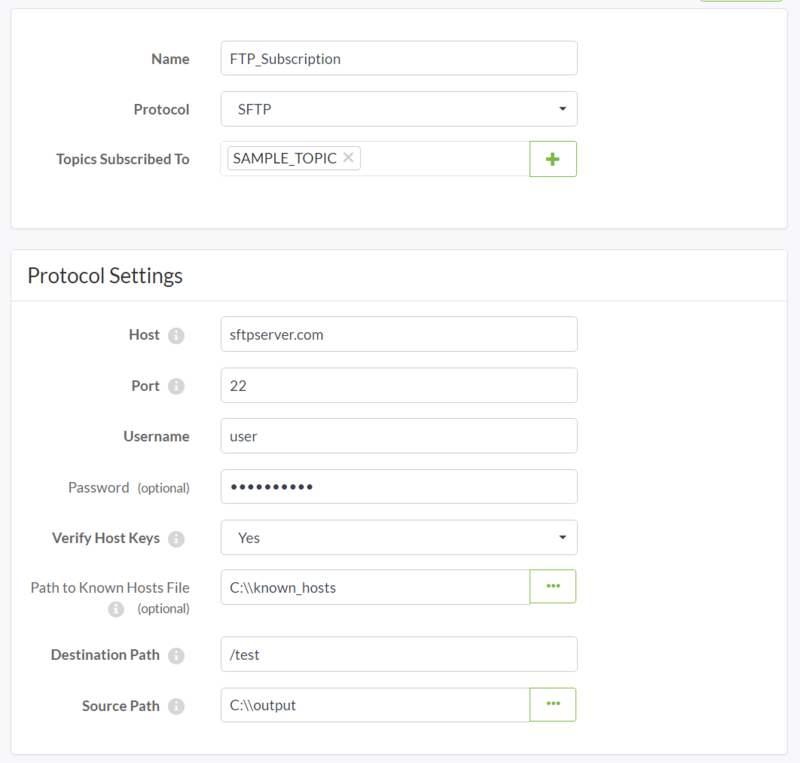 The SFTP subscriber receives notifications from topics and uploads files over a Secure Shell (SSH) connection to specified SSH File Transfer Protocol (SFTP) hosts. In the FME Server Web User Interface, select Notifications > Subscriptions, and click New. Name: Provide a name for the subscription. Topics Subscribed To – Specify the Topics you want to subscribe to using the drop-down selector. To create a topic and use it right away, click +. Host – The SFTP host name. Port – The SFTP port number. The default value is 22. Username – The SFTP user name for authentication. Password – The SFTP user password for authentication. Verify Host Keys– Choose whether or not to verify the host key for the server being connected to. Path to Known Hosts File – If Verify Host Keys is Yes, specify the path to the known_hosts file that contains the public keys for any servers you wish to connect to. If the known_hosts file is saved to a Resources directory, click the ellipsis (...) and select the file. Otherwise, enter the file path directly. File paths must use forward slashes (/) or escaped backslashes (\\). Note: A known_hosts file contains public keys for computers you connect to via SSH. To obtain a public key and insert it into the known_hosts file, run the following command in OpenSSH: ssh-keyscan -t rsa <hostname> > <path_to_known_hosts_file>. Alternatively, contact your system administrator. For more information about OpenSSH, and to install, see http://www.openssh.com/. Destination Path – The destination path to upload the file. Source Path – The source file to upload. If the source file is saved to a Resources directory, click the ellipsis (...) and select the file. Otherwise, enter the file path directly. File paths must use forward slashes (/) or escaped backslashes (\\). sftp_host: The SFTP host name. sftp_port: The SFTP port number. sftp_username: The SFTP user name for authentication. sftp_password: The SFTP password for authenticatdion. sftp_verifyhost: Whether or not to verify the host key for the server being connected to. Specify "yes" or "no". sftp_knownhosts: If "sftp_verifyhost" : "yes", specify the path to the known_hosts file that contains the public keys for any servers you wish to connect to. sftp_remotedestination: The destination path to upload the file. sftp_localsource: The path to the source file to upload. Note: Specify file paths using forward slashes (/) or escaped backslashes (\\).